Movistar’s J-J Lobato celebrated his stage win at the Ruta del Sol by mimicking holding a mobile phone, in honour of his sponsor’s brand. But when the riders aren’t pulling off promotions for the people who pay their wages, they can often pull off some memorable salutes when they reach the finish line. Here are five of the most memorable celebrations from recent years, including one man who’s taking inspiration from a Tour de France legend. 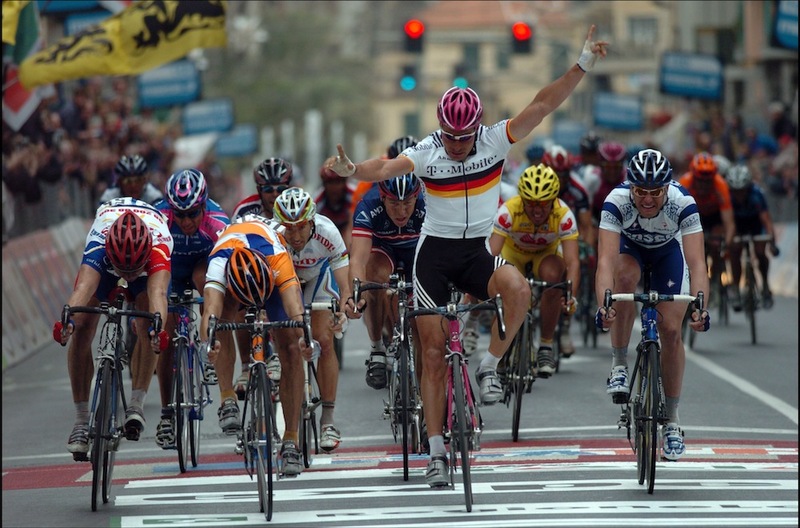 The German sprinter was a bit premature with his celebration at the 2004 Milan-San Remo, throwing his arms up in the air before being pipped to the finish line by Oscar Friere. It was unfortunate for the T-Mobile rider, who would have won his fifth Primavera if he had maintained his sprint until the line, instead handing Rabobank’s Friere his first of three wins in the Monument. He’s not known for holding back either on or off the bike, releasing his anger by throwing his bike away in Tirreno-Adriatico, and punching the air as he won the Tour de France 2012’s final time trial. You can see how much the win means to the now knighted Wiggins, fulfulling the childhood dream that had, at the time, escaped any other British rider. El Pistolero fires plenty of warning shots to his rivals in the mountains and tops it off with his gunshot celebration as he crosses the line. The Manx Missile has toned down his celebrations in recent years, preferring just to punch the air when he wins a race, but he was a bit more expressive in his early days. During the 2010 Tour de Romandie, Cav stuck two fingers up as he crossed the line, apparently as a message to “journalists and commentators who know jack-**** about cycling”. He later apologised and reverted back to imitating a phone call, which must have pleased his HTC sponsors slightly more. 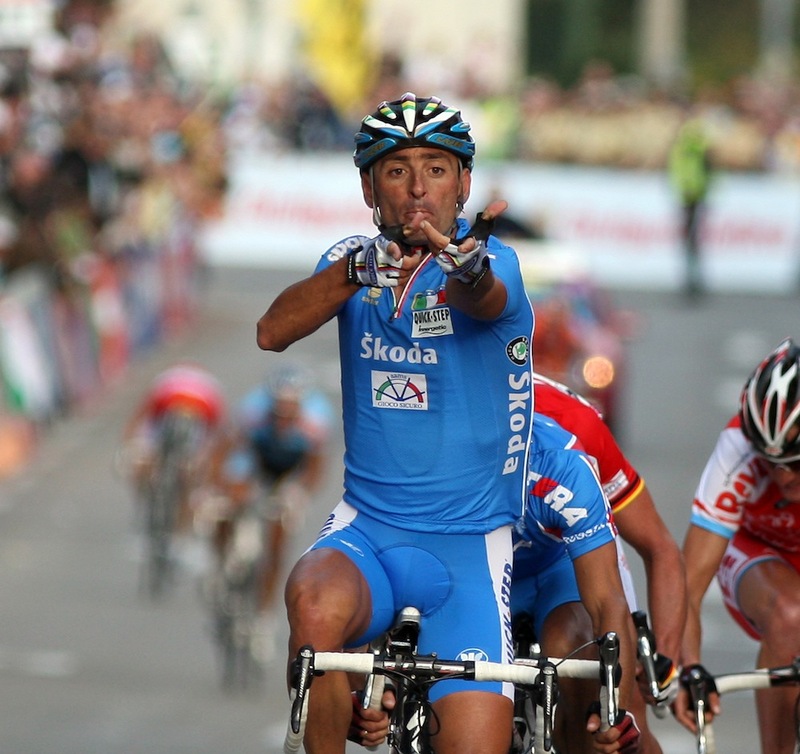 The Italian won the World Championship road race in 2007, having been threatened with exclusion for his failure to sign an anti-doping pledge. Bettini regularly distanced himself from doping activity in the peloton and gained a court injunction to defend his rainbow stripes in Stuttgart. 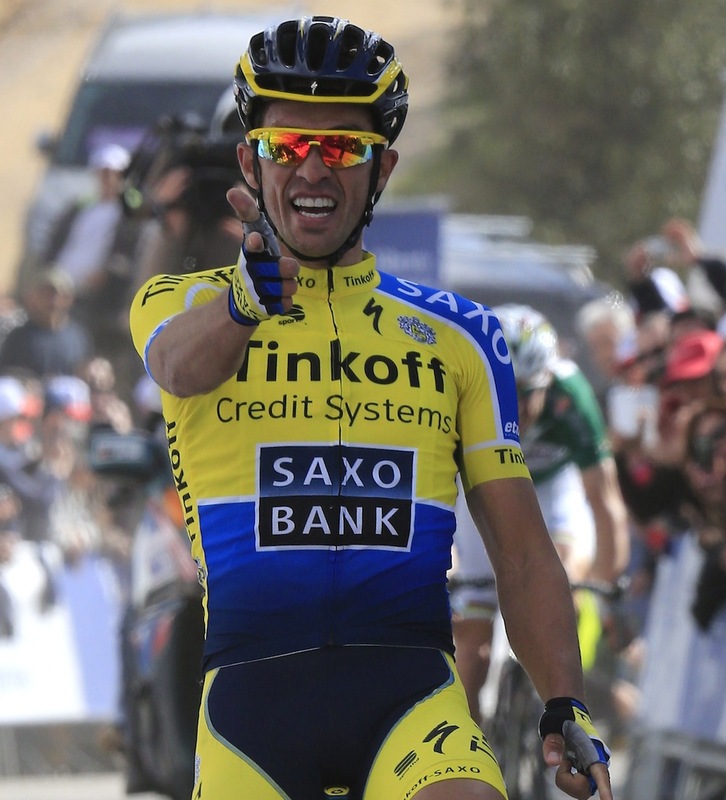 He didn’t disappoint either, taking the victory and going one better than Contador’s pistol, by bringing out a shotgun celebration. The cycling world seems in awe of Peter Sagan‘s famous bike handling skills, with countless videos hitting the web of the Slovakian champion performing wheelies on demand. But let’s not forget that a certain other three-time Tour de France green jersey winner was pulling that trick before it was even cool. 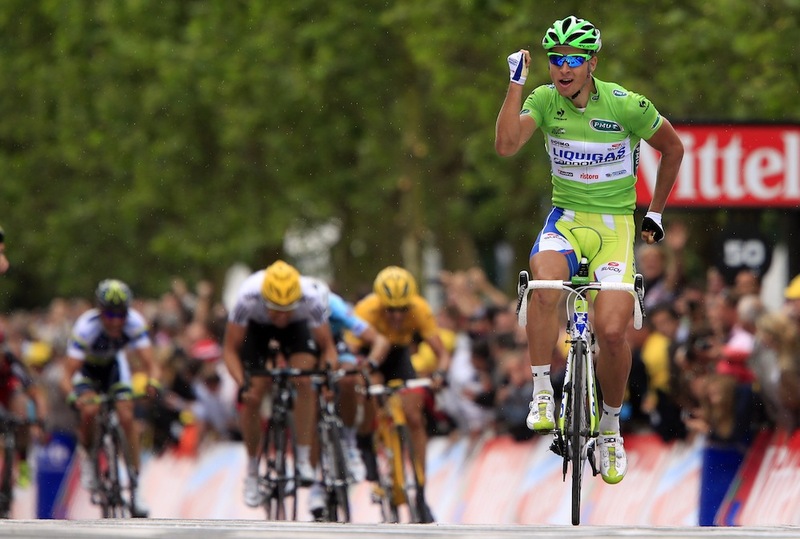 When crossing the line in one of his three victorious stages in the 2006 Tour de France, Robbie McEwen pulled out the ‘running man’ celebration, later performed by Sagan when winning stage three of the Tour in 2012. Get your own celebrations, Peter!